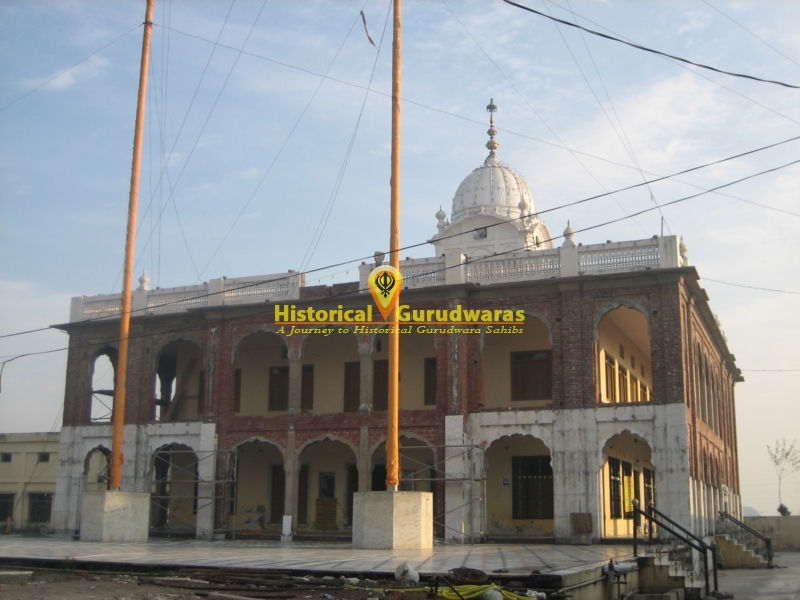 GURUDWARA SHRI SANGRAANA SAHIB is situated on the Taran Taaran Road in Amritsar Distt. 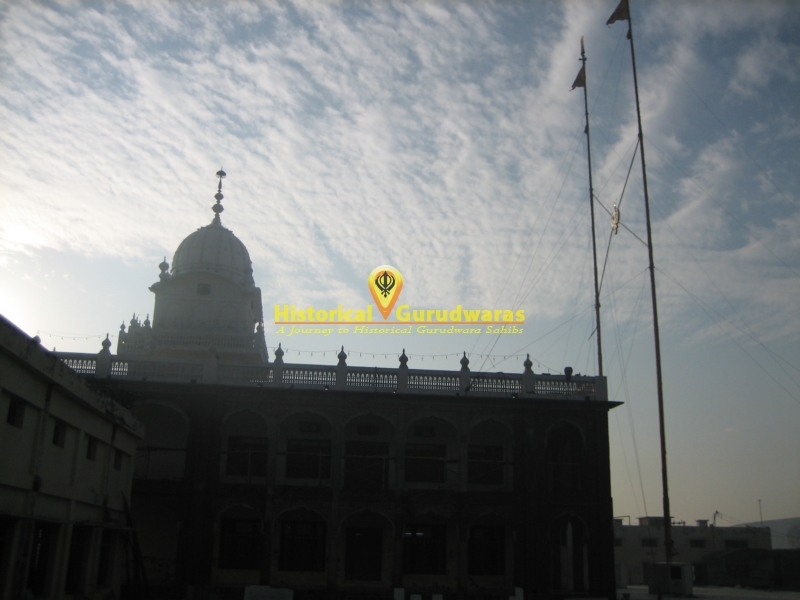 This is that place where Dhan Dhan SHRI GURU HARGOBIND SAHIB JI won his first battle & gave a boon of 7 sons to MATA SULAKHNI JI. After the death of Emperor Jahangir on 8th November 1627, Shahjahan became the Emperor of Hindustan on 6th February 1628. Shahjahan inducted Kuleej Khan as the Governor of Punjab. Kuleej Khan kept Mukhlis Khan as the Army Commander. 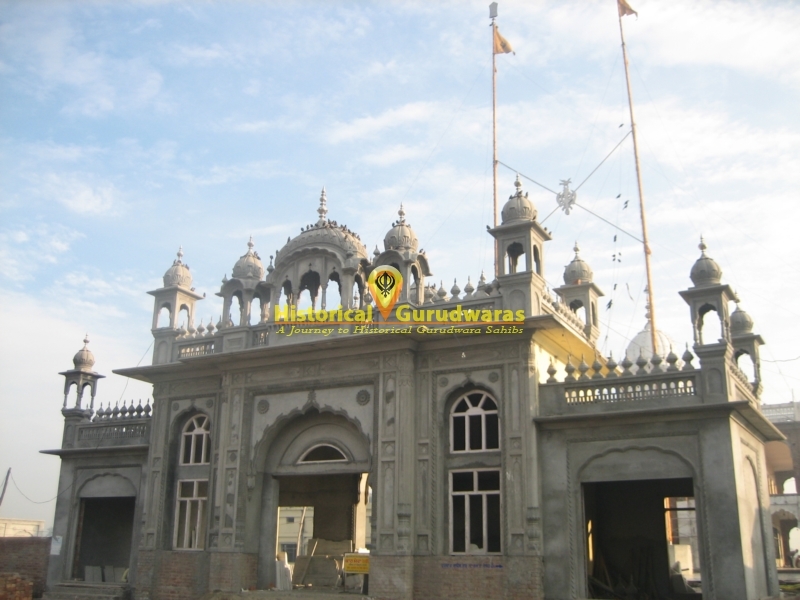 Once upon a time, the Sikhs while hunting reached the Sanctuary of Gumtala. That Sanctuary was reserved for hunting only for Royal Governors. The Royal Army was already hunting there. One Hawk of the Royal Army was flying in the sky. The Sikhs also flew one Hawk into the sky. The Hawk of the Sikhs threw the Royal Hawk to ground. The Sikhs captured the Royal Hawk. The Royal Army asked the Hawk back & also spoke some bitter words. On hearing this, the Sikhs refused to give the Hawk back. The Royal Army went to Lahore & gave a exaggerated report of the whole incident & said that today the Sikhs have captured the Hawk, tomorrow they will catch hold of the crown only.The Governor in turn gave an exaggerated report to Shahjahan & asked for permission to attack. Shahjahan gave permission to attack. Kuleej Khan sent his Army Commander Mukhlis Khan along with 7000 soldiers to attack Amritsar. On 15th May 1629, the Army reached Amritsar. GURU SAHIB was not expecting the attack so soon but when the battle was just in front of them, He accepted the challenge happily & started to prepare for an attack on the enemy. 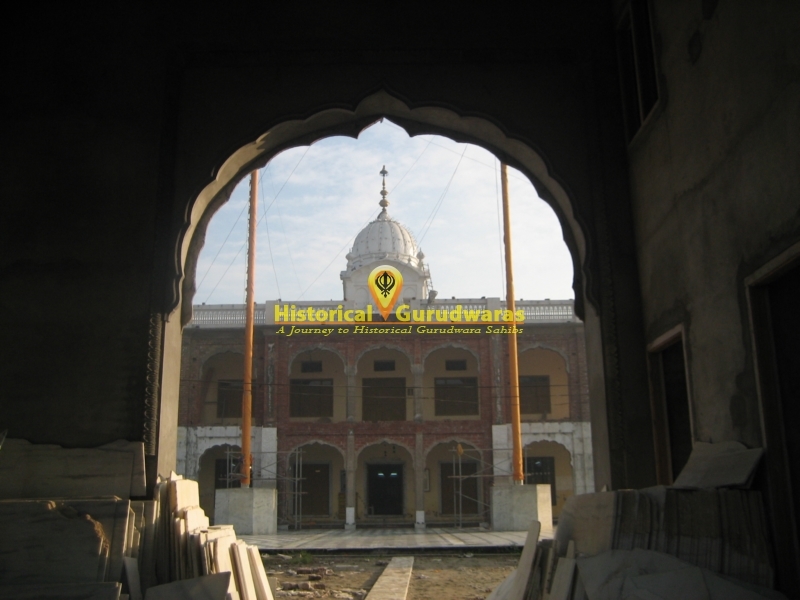 While staying at PIPLI SAHIB, the Sikhs had an encounter with their enemies. The Sikhs took this battle as a battle for religion & accepted it happily. BHAI BIDHI CHAND took charge & challenged the Royal Army. 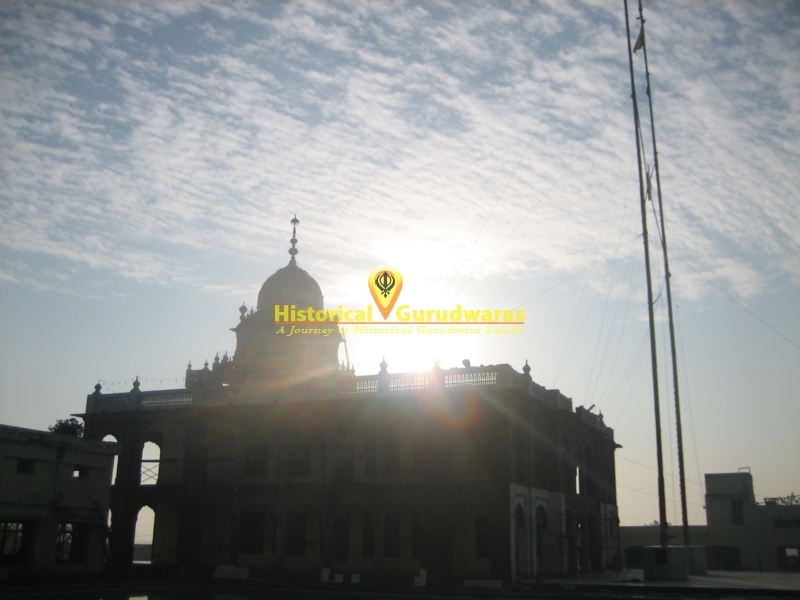 In those days only, GURU HARGOBIND SAHIB\"s daughter, BIBI VEERO\"s marriage was also planned. The marriage party had to come to Amritsar, the battle started before the marriage. A fierce battle took place. When Samshat Khan started to loose, Amber Khan came for his help. From this end BHAI BHANA JI\"s soldiers started firing. Samshat Khan attacked BHAI BHANA JI in a fit of anger & in return BHAI JI responded with a solid attack which beheaded Samshat Khan. On seeing Samshat Khan dying, the Royal Army circled BHAI BHANA JI & killed him with heavy firing. He was martyred in the battle of PIPLI SAHIB. Now Muhammed Ali came ahead. The Sikh forces were now being headed by BHAI SINGHA JI. BHAI NIHALA, BHAI TOTA, BHAI TIRLOKA, BHAI NANTA were fighting very bravely & were stopping the army to go towards HARMANDIR SAHIB. Muhammed Ali aimed at BHAI SINGHA JI & fired at him following which BHAI JI got injured & fell. He cautiously got up & hit Muhammed Ali with an arrow & he fell. When BHAI SINGHA JI got martyred, PAINDE KHAN took charge.When GURU SAHIB, while taking care of the hilly, came to Lohgarh Fort, Mukhlis Khan attacked the Fort. On being asked by GURU SAHIB, one sikh carpenter from Khemkaran made a stone cannon out of a tree which had dried. Using this, there was a rain of stones from inside the Fort which made Mukhlis Khan\"s Army to loose ground. One battalion of the army attacked the town from Bibeksar side. Mukhlis Khan\"s army had a large quantity of arms but the Sikhs had strong determination & GURU\"s trust with them. Sikhs like BHAI TOTA, BHAI TIRLOKA, BHAI NANTA & BHAI NIHALA got martyred while fighting in high spirits. On the other hand Karim Beg, Jang Beg, Salman Khan got successful in bringing down one of the walls of the Fort. 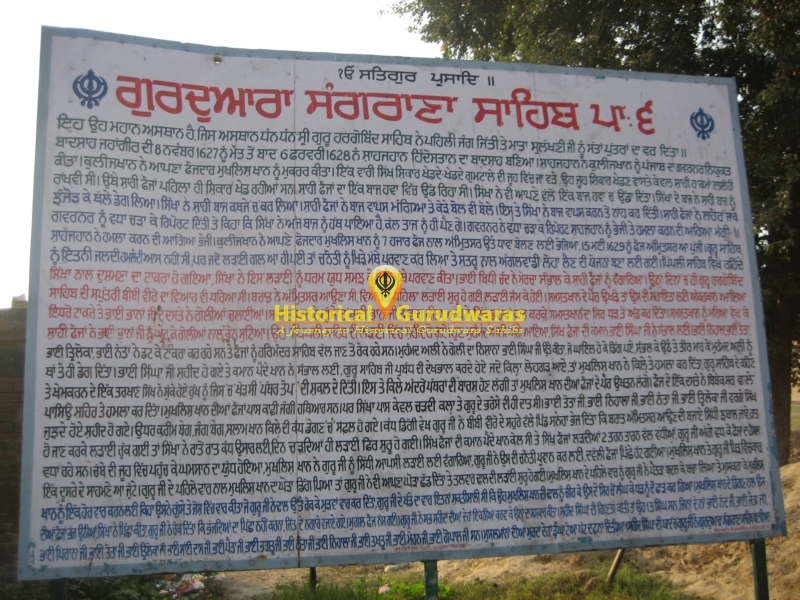 On seeing the wall coming down, GURU SAHIB sent a message to the village of in-laws of BIBI VEERO that the marriage party should go directly to Jhambal instead of coming to Amritsar. As night fell, the battle stopped & the Singhs constructed the wall overnight. As the day started, the battle started again. The charge of the Sikh army was in the hands of Painde Khan & the Sikh army moved towards Tarn Taaran while fighting. GURU SAHIB was moving ahead in order to motivate the army. One reaching the sanctuary of Chabbe, a fierce battle started. Mukhlis Khan challenged GURU SAHIB for a one-on-one fight. GURU SAHIB accepted his challenge & both the armies stepped back. Mukhlis Khan & GURU SAHIB came in the arena facing each other. With the first strike of GURU SAHIB, Mukhlis Khan\"s horse fell down following which GURU SAHIB left his horse also and a battle of sword & shield started. GURU SAHIB saved Mukhlis Khan\"s first attack & smilingly asked Mukhlis Khan to attack again. Mukhlis Khan attacked in a fit of anger & gush which GURU SAHIB stopped with his shield and in return attacked Mukhlis Khan with his sword with such a force that it pierced through the shield and beheaded him. As Mukhlis Khan fell, his army ran away. The Sikhs started running behind them but GURU SAHIB stopped them saying that we should not follow who run away. The drums of victory were played. The Mughal Army ran away. GURU SAHIB got the bodies of all the martyrs together & cremated them. When the martyred Singhs were counted, they were 13 Singhs namely BHAI NAND JI, BHAI JAITA JI, BHAI PIRANA JI, BHAI TOTA JI, BHAI TIRLOKA JI, BHAI SAI DASS JI, BHAI PAIDA JI, BHAI BHAGTOO JI, BHAI NANTA JI, BHAI NIHALA JI, BHAI TAKHTOO JI, BHAI MOHAN JI, BHAI GOPAL JI. The dead Muslims were buried by digging a deep pit. 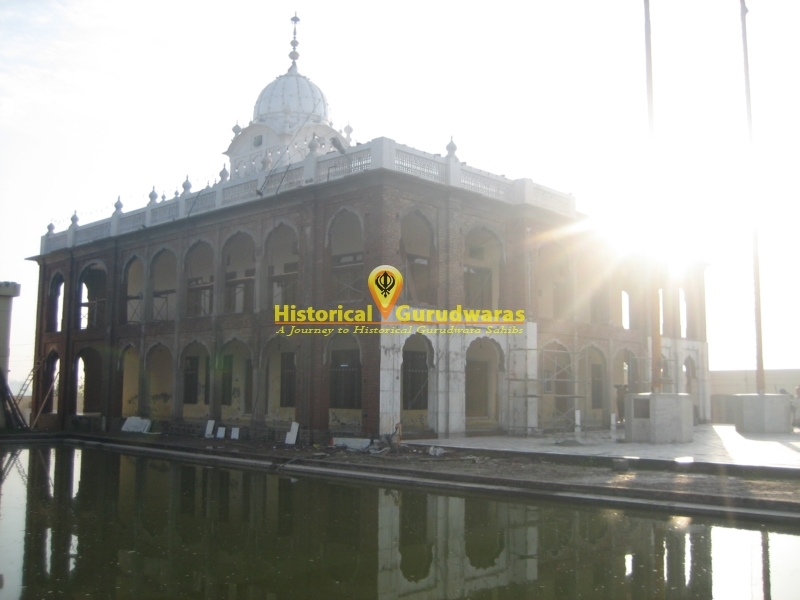 GURU SAHIB got GURUDWARA SANGRANA SAHIB built in remembrance of the martyred Singhs.